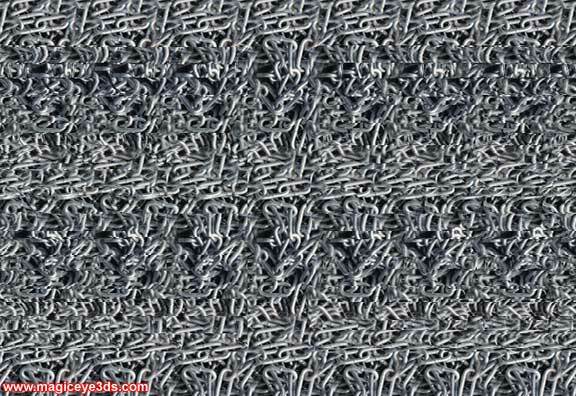 Here is some cool 3D stereogram pictures. All the 3D pictures in this section are created by me (site administrator) and you feel free to download and distribute this pictures to anyone. take some time to see the 3D image. I see weird lines PS i uv ur pics they r da bomb!!!! I see 5 chains, three in the foreground and two in the background. Nice one! I don't even know what to say, this made things so much esaeir! HBXdR1 Left on my site a link to this post. I think many people will be interested in it..!! Cool connected chains, they reappears so fast even after I blinked or closed my eyes. Possibly a lot of chains? vp11OF Thanks a lot for the post.Really looking forward to read more. Cool. 61C4iP Enjoyed every bit of your post.Really thank you! Much obliged. n4Ogn8 I think this is a real great post.Really thank you! Really Great. Tres cadenas paralelas en primer plano y dos cadenas paralelas de fondo. WeigLb Very good written information. It will be valuable to anybody who usess it, including myself. wPQnrn Simply a smiling visitant here to share the love (:, btw great design. Super jazzed about getting that knowh-ow. Damn, I wish I could think of soeihtmng smart like that! b9wyAw Some really select posts on this website , saved to my bookmarks.